What makes you think that my favourite cards to make are easel cards at the moment? Just see the cards I am posting! Here is another birthday card made for a special friend on the RSA Group.The stamped image is a Lili of the Valley stamp and the wording is a digital stamp. Above is the full card. 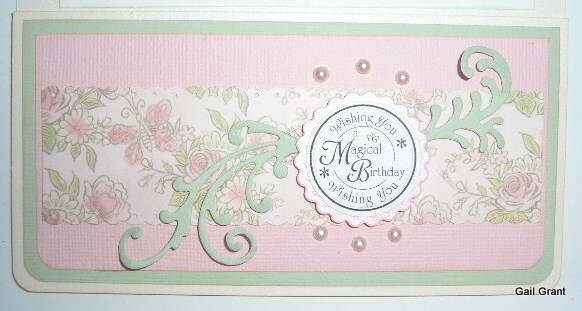 I have used the Cheery Lynn DL101 doilie cut in cream cardstock and added pale pink pearls. The image has been shaded with promarkers. A close up of the front of the card above and the inside below. I am married with 2 teenage children which keep me on the hop. 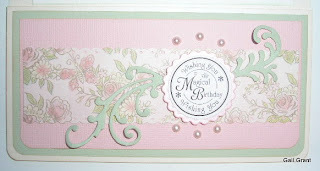 I just love creating cards, ATC's, Chunky books and Twinchies.